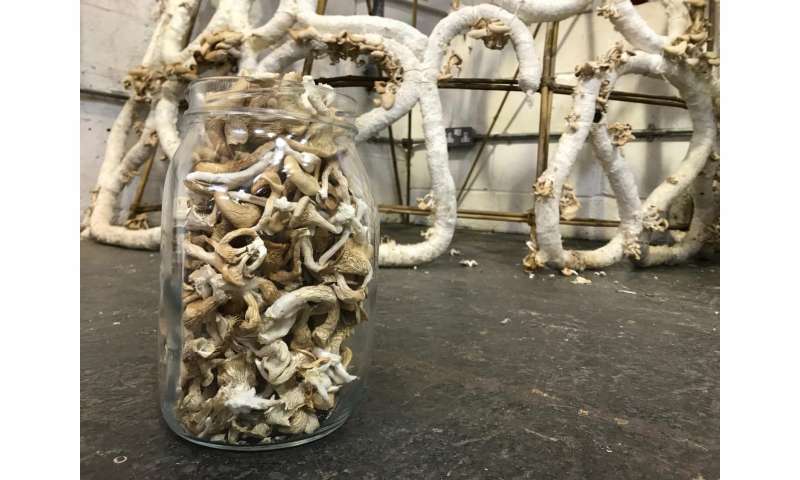 A Brunel University London student has been exploring how mushrooms can be used to grow robust zero-waste structures as an alternative to conventional building techniques. In collaboration with environmentally-focused architecture firm Astudio, Aleksi Vesaluoma's Grown Structures, use mycelium (oyster mushroom spawn) mixed with cardboard. The material is then molded into 'mushroom sausages' by packing the mixture into a tubular cotton bandage. The mushroom sausages are shaped over a mold of the preferred shape and grown over four weeks in a ventilated green house, resulting in a striking structure with potential use at festivals or other events that could be easily biodegraded afterward. The large quantities of gourmet mushrooms which pop out from the structure can also be picked and eaten, creating a novel architectural surrounding which doubles as a food source. A pop-up restaurant grown from mushrooms, serving mushroom meals, is just one potential idea for the project's future, say the creators. 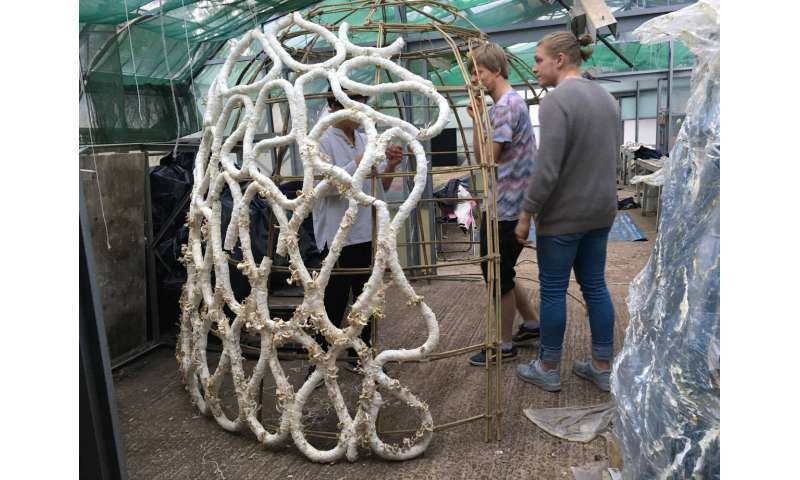 While a number of designers, artists and companies are also working with mycelium in a range of different ways, Aleksi's artistic and versatile new 'sausage' technique is new to the field and a launch-pad for further developments – enhancing the structure's strength, reshaping into different designs, or building on a smaller scale, for example. "Right now the main factors holding back the mass-commercialisation of mycelium materials are people's pre-assumptions, as well as the power of the profit-driven materials industry," Aleksi explains. 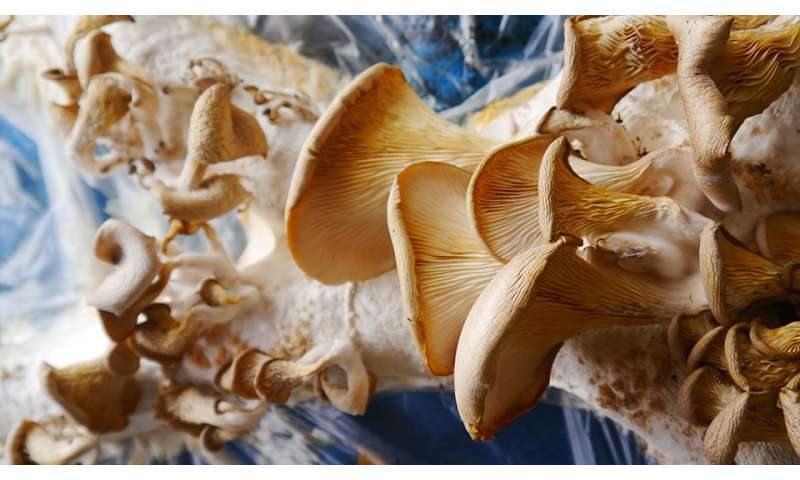 "Mycelium materials are beneficial to us and the environment as well as just being… really cool. They're another great example of why we need to trust the intelligence of nature in helping us create more regenerative systems of manufacture." When mycelium grows throughout organic materials such as straw, it binds the matter together like glue. The resulting materials are extremely versatile and when used in construction, have the potential to ease environmental problems caused by resource deletion, deforestation for wood or toxic emissions from brick firing. "Exploring the structural potentials of mycelium materials could help in shaping a future where architecture is grown from bottom up rather than consuming resources and creating waste," Aleksi adds. "Various solutions are being commercialised in the USA and Netherlands but in my opinion the material needs to be introduced to a much wider market, including the UK." Aleksi and friends have recently formed the design collective MANDIN. Visit www.mandin.earth for more information. Toadstool footstools: Are organisms manufacturing's future?